Authorities in western India on Tuesday prevented activists from reaching a Hindu temple where they planned to protest against a centuries-old tradition that admits only men to the most holy part of the structure. The group had booked a helicopter to fly over the temple, where Ms. Desai said she planned to descend from a rope to offer prayers inside the shrine’s open-air platform where an idol of the deity Shani–embodiment of the planet Saturn, associated with misfortune and obstacles in Hindu astrology –stands. Only male priests are allowed on the platform, temple officials say. Ms. Desai said authorities denied her permission to bring an aircraft to the area, but the group planned to march on the temple on foot. 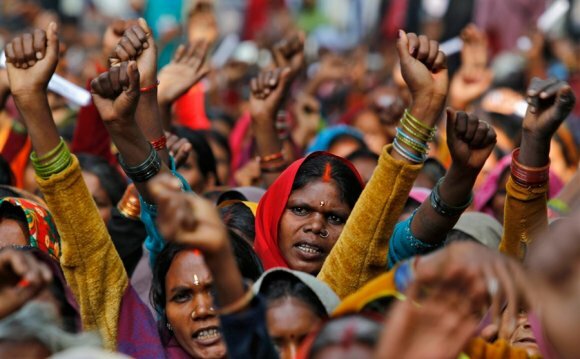 Local police stopped the march, briefly detaining Ms. Desai and 300 other women and about 50 men as they made their way to the temple, said Pankaj Deshmukh, a senior district police officer. “We anticipated a law and order problem because of likely clash between the activists and local people, ” Mr. Deshmukh said. Access to places of worship in India has long been an issue and women are starting to challenge these religious traditions. Activists have been challenging rules that block women from entering religious places and exclude them from certain roles in Hinduism, Islam and Christianity. Bala Bankar, head of the Shingnapur village after which the temple in Maharashtra is named, said locals cherish the old traditions. Close to 4, 000 local men and women from the area blocked roads to the temple to stop the activists, he said. Shani Shingnapur temple authorities said that both men and women devotees are treated equally but only male priests are allowed inside the platform where the idol is located. 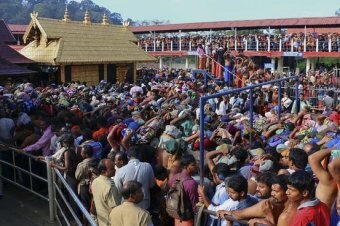 “It’s a 400 to 500 years old tradition that only the male priests who are celibate since childhood can worship inside the platform and it can’t be broken now, ” said Sanjay Bankar, manager of the temple and uncle to the head of the village. Protest leader Ms. Desai met with Maharashtra’s chief minister, Devendra Fadnavis, Wednesday to discuss her group’s demands. “We have requested him that government should ensure equal access for women to all the temples and religious places in the state and all over the nation, ” Ms. Desai said. The showdown in Maharashtra is just the latest recent attempt by women’s rights activists to try to assert their right to worship. In November, one group launched a “happy to bleed” campaign on Twitter after the head of the board of the Hindu Sabarimala temple in southern India said that young women would be barred from entering the temple until a machine was invented to detect if they were menstruating. .
Women who are menstruating are considered impure and kept out of religious activities and domestic chores like cooking in many traditional Hindu families.